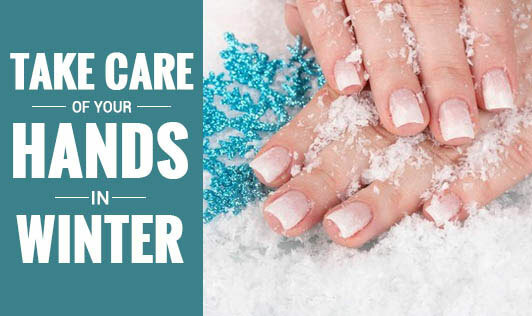 Winter can make our hands rough and chapped. The main culprit is lack of moisture. While the humidity in the outside atmosphere is low in winter, we create a low humidity inside our homes and offices too by switching on air-conditioners or indoor heaters. Moisturise regularly. Apply a moisturiser everyday on your hands immediately after a bath. Or soak your hands in warm water for about 5 minutes before you apply it. If you begin to apply the moisturiser just before winter begins and your hands start to chap, you have a better chance of maintaining soft hands in winter. Petroleum jelly (eg - vaseline) works well too. If you don't wish to buy creamy moisturisers, applying a layer of petroleum jelly after your bath can work wonders for your hands. Drink plenty of fluids. Even though you feel less thirsty in winter, your body requires adequate hydration. Use a mild soap to wash your hands. Avoid harsh soaps. If required apply a moisturiser soon after a hand wash.
Pat your hands dry gently instead of rubbing them vigorously with a towel. Wear gloves or mittens when you go out. Exercise regularly. Better blood circulation brings in the required noursihment to different parts of your body. If skin peeling persists, meet a dermatologist (skin specialist).